Many times people inquire as to what is an appropriate amount for bodily injury coverage. In answering this question, it is important to consider three basic issues. Firstly, because the law in Pennsylvania limits the amount of underinsurance and uninsurance coverage to no more than the amount of your bodily injury liability coverage, you may want to increase your bodily injury liability coverage specifically so that you can also increase your own underinsurance and uninsurance protection. An experienced auto accident attorney is available to answer questions with regard to auto insurance coverage, preferably before you find yourself a party in a motor vehicle crash dispute. 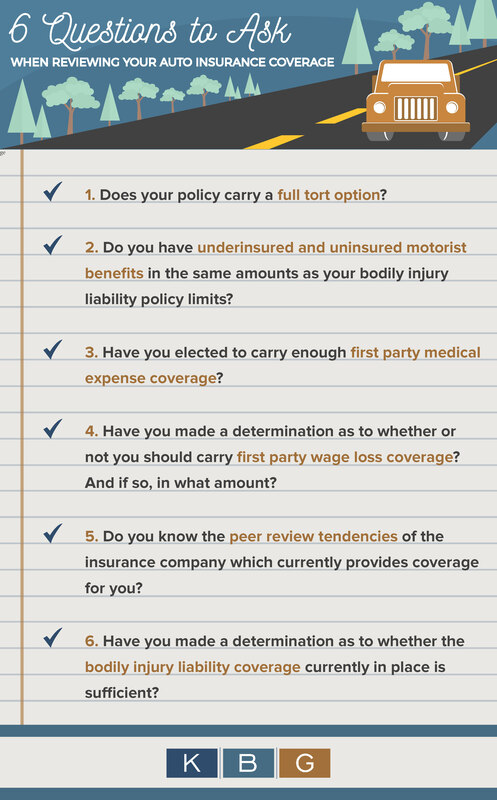 In addition to answering your questions, auto accident lawyers KBG Injury Law is available to review specific coverages as indicated on the declaration pages of any policy that you may have in effect at the current time. 1. Does your policy carry a full tort option? 2. Do you have underinsured and uninsured motorist benefits in the same amounts as your bodily injury liability policy limits? 3. Have you elected to carry enough first party medical expense coverage? 4. Have you made a determination as to whether or not you should carry first party wage loss coverage, and if so in what amount? 5. Do you know the peer review tendencies of the insurance company which currently provides coverage for you? 6. Have you made a determination as to whether the bodily injury liability coverage currently in place is sufficient or whether there is a reason for increasing some? Secondly, you should consider the potential circumstance of a single car crash wherein one member of the family is driving, and at fault, and other members of the family suffer injury as a consequence thereof. Under such a set of circumstances, you may have as your only source of insurance, the policy covering the single vehicle involved. In this event, the amount of compensation payable by the insurance company would be limited by the bodily injury liability coverage on that policy. In an effort to better protect your family against such a foreseeable circumstance, you may want, therefore, to raise your bodily injury liability limits. Thirdly, you should make certain that the bodily injury liability coverage is sufficient to protect your own assets and net worth. Because it is foreseeable that any one of us could cause a motor vehicle crash involving serious bodily injury or property damage, it is important to make certain that you have sufficient coverage to protect against a claim in excess of the bodily injury and property damage liability protection, which could result in a deficiency judgment against you and exposing individual assets to enforcement. Insurance coverage is broken into several categories. See our Insurance Basics section for more specific information concerning the coverage that is available under Pennsylvania Law. The time you spend today to make sure that you are adequately insured will protect you and your family, especially with regard to the parts of your insurance which protect you directly in the event you are in an accident through the fault of another. It is imperative that you protect yourself and family in this regard. You should have ample medical coverage, especially if you do not have health insurance as a back up. Perhaps most important is Uninsured and Underinsured Motorist coverage. These coverages protect you in the event that the at fault party is either uninsured or is underinsured. By having these coverages you ensure that you will be compensated for your losses no matter what level of coverage the other person has under his policy.